Sorry, PC owners—you'll be getting Grand Theft Auto V a little late this year. Rockstar has delayed the upcoming PC port of their massive open-world game to March 24. The good news: Rockstar says the much-anticipated heists are (finally) coming to GTA Online before then. Heists will launch on consoles "in the coming weeks" before that March 24 PC release, the developer says. "Our apologies for the slight shift in the date but the game requires a few extra weeks of testing and polish to make it as good as can be," Rockstar writes on their newswire. "Moving a release date is never a decision we take lightly and is a choice we make only when we know it is in the best interests of the game and our fans. Thanks everyone for your understanding and we assure you these few extra weeks will be worth it when the game does arrive in March." 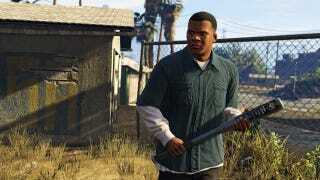 The PC version of Grand Theft Auto V was originally due to come out this month.